Hydropower is generated from the water flowing in the river or oceans. There are two water cycles involved in the generation of electricity. One water cycle is the natural cycle and the other is inside the hydropower station. In our natural environment there are number of oceans and rivers and then there is sun above them all. Due to solar energy the surface of the rivers and oceans get heated due to which the water on the surface evaporates. The evaporated water vapors move towards the upper layers of the atmosphere where they form the clouds. Upon precipitation of clouds rain occurs. Due to heavy rains large quantities of water flows through various parts of the earth in the forms of streams, channels and rivers. All the water from rivers is collected back to the oceans, where evaporation of water occurs again. The water in rivers posses two types of energies: kinetic energy and potential energy. The energy of water due to its high level is called as potential energy. 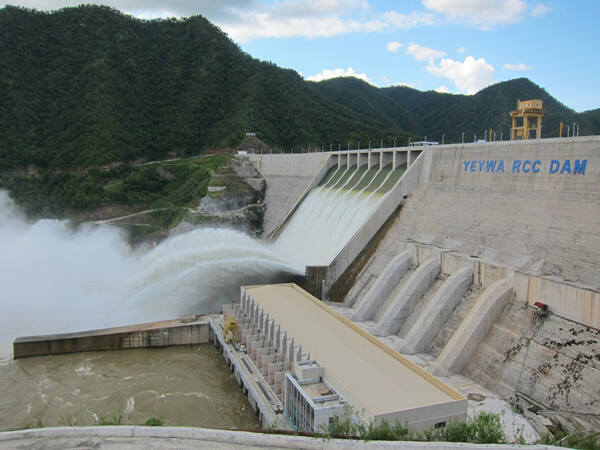 The dam is the most important component of hydroelectric power plant. In fact the name ‘dam’ is considered to be synonymous to the ‘hydroelectric power plant.’ The dam is built on a large river that has abundant quantity of water throughout the year. The dam is built at location where the height of the river is sufficiently high so as to get maximum possible potential energy from water. Water reservoir is the place behind the dam where water is stored. The water in the reservoir is located at the height above the rest of the dam structure. The height of water in the reservoir decides how much potential energy water possesses. Higher the height of water more is its potential energy. The high position of water in the reservoir also enables it to move downwards effortlessly due to gravity. These are the gates built on the inside of the dam. The water from reservoir is released and controlled through these gates. When the control gates are opened the water flows due to gravity through the penstock and towards the turbines. The water flowing through the gates possesses potential as well as kinetic energy. The penstock is the long pipe or the shaft that carries the water flowing from the reservoir towards the power generation unit that comprises of the turbines and generator. The water in penstock possesses kinetic energy due to its motion and potential energy due to its height. The amount of water flowing through the penstock is controlled by the control gates. When water falls on the blades of the turbine the kinetic and potential energy of water is converted into the rotational motion of the blades of the turbine. Due to rotation of blades the shaft of the turbine also rotates. The turbine shaft is enclosed inside the generator. It is in the generator where the electricity is produced. The shaft of the water turbine rotates in the generator, which produces alternating current in the coils of the generator. The electricity generated inside the generator is not of sufficient voltage. The transformer converts the alternating current produced from within the generator to the high voltage current. The water that has been used to rotate the turbine blades and turbines shaft leaves the power generation unit entering the pipeline called as the tailrace. From here the water flows into the main river. The height of water in the tailarace is much below the height of water in the water reservoir behind the dam.